This 7 day safari provides the perfect opportunity to delve a little deeper into Uganda’s amazing national parks and incredible range of wildlife. On this trip you will come up close with chimpanzees and gorillas, view stunning landscapes, watch tree climbing lions and enjoy game drives in amazing wildlife areas. 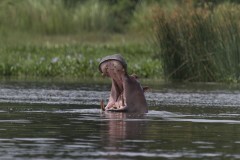 Uganda has been rated the 1 travel destination in the world by Lonely Planet and you are going to discover why! The chance to see rare tree climbing lions. 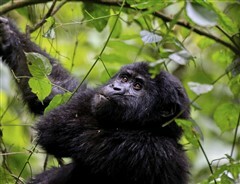 Maximise your time on the ground by flying to the Bwindi National Park. Trek through dense rainforest to meet our closest relatives, the Mountain Gorillas. Gorilla and chimpanzee tracking experiences. Take an optional trek to visit the Batwa pygmies, the original inhabitants of Bwindi who have shared home with the mountain gorillas for all their life. 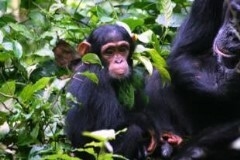 Add another night in Kibale National Park and enjoy a more leisurely experience in this spectacular region of Uganda. Upon arrival to Entebbe airport, you will be met by our represnetative and transferred to your hotel. The remainder of the day is at your leisure. Your flight this morning will depart Entebbe and arrive in Kihihi or Kisoro airstrip where you will be met by our representative and transferred by road to your accommodation in Bwindi. Flying over the third largest lake in the world will give you an incredible perspective of just how beautiful Uganda is. Lake Victoria is dotted with several islands and fishing villages which can be seen at taking off and landing. *Please note: the transfer from Kihihi airstrip to the Buhoma sector of Bwindi will take around 1.5 hours and the road can be a little bit bumpy, it does give you enough time to contemplate your gorilla adventure ahead as well as being captivated by the incredible scenery synonymous with this part of Uganda. The Bwindi Impenetrable National Park is situated in south western Uganda, on the edge of the Western Rift Valley and is home to 326 gorillas, almost a half of the world’s population of mountain gorillas. 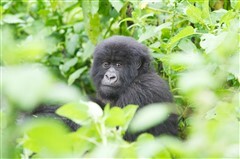 Bwindi is also a bird watchers haven! It holds 346 species of birds and an experienced bird watcher can identify up to 100 species in a day! This morning you will enjoy an early breakfast before we transfer you to the National Park headquarters for your trek briefing. After this, you will enter the forest and enjoy the early morning beauty and freshness of the forest which is home to more than half of the world’s mountain gorillas. Tracking the gorillas can take several hours of challenging walking in wet and muddy conditions but is absolutely worth the effort. Once we locate the gorillas we spend an hour with them before returning to your lodge for dinner and reflection on an unbelievable day. After breakfast we depart the Bwindi National Park and drive through farmland before reaching the Queen Elizabeth Park which is famous for its rare tree climbing lions. We arrive at the lodge in time for lunch before taking an afternoon game drive to search for tree climbing lions, monkeys and the huge variety of bird life that inhabit the park. Return to your lodge in time for a relaxing meal. Today we have an early start in time for a morning game drive in search for the rare tree climbing lions. Later we set out for Mweya arriving in time for lunch at your lodge. After lunch we enjoy an afternoon boat cruise on the spectacular Kazinga Channel. This waterway is a home to a variety of water birds and on a hot day you are likely to see hippos, elephants, buffaloes, crocodiles and waterbucks at the water edge. This morning we depart for the Kibale Forest National Park, reputable for having the greatest variety and highest concentration of primates in East Africa. We arrive in time for lunch and in the afternoon depart on a chimpanzee trek where we search for chimpanzees and other primates including phoestes, Red-Colobuses, Blues, Red-tailed and grey cheeked Mangabeys, butterflies and many small insects. The guide will provide detailed explanations on not only the primates which inhabit the region, but also on all the forest's fauna and flora, ensuring that your walk is informative, enjoyable and excellent for viewing bird life and primates in close quarters. Morning breakfast and transfer to Entebbe where your tour comes to an end.